How can we stay engaged with life day after day? How can we continue to love–keep our minds in a happy mood–when life is complex and often challenging? These are questions that Sylvia Boorstein addresses in Happiness Is an Inside Job. 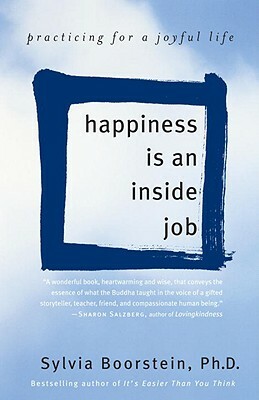 In more than three decades of practice and teaching she has discovered that the secret to happiness lies in actively cultivating our connections with the world, with friends, family, colleagues–even those we may not know well. She shows us how mindfulness, concentration, and effort–three elements of the Buddhist path to wisdom–can lead us away from anger, anxiety, and confusion, and into calmness, clarity, and the joy of living in the present. Sylvia Boorstein, Ph.D., is a co-founding teacher at Spirit Rock Meditation Center in Woodacre, California, and a senior teacher at the Insight Meditation Society in Barre, Massachusetts. She writes a regular column for Shambhala Sun, lectures widely, and is the bestselling author of Pay Attention, for Goodness’ Sake; It’s Easier Than You Think; Don’t Just Do Something, Sit There; and That’s Funny, You Don’t Look Buddhist. A practicing psychotherapist, Boorstein is a frequent presenter at psychology conferences and training seminars. Sylvia and her husband, Seymour, divide their time between Sonoma County, California, and their home in France.